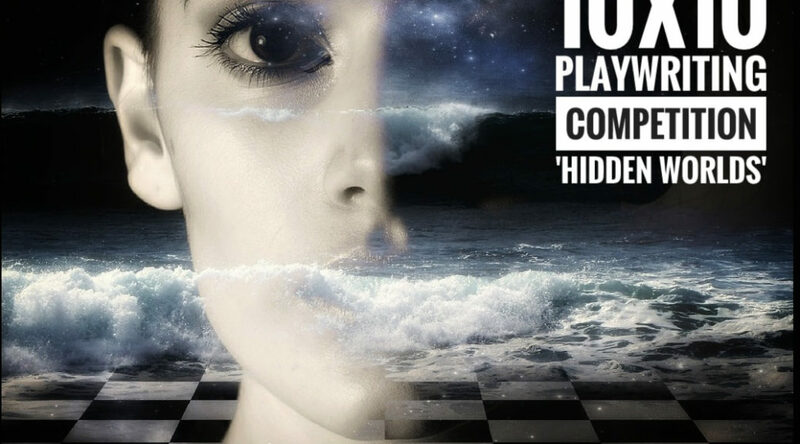 Description: Chesil Theatre is inviting submissions of ten-minute plays based on the theme, HIDDEN WORLDS. Ten plays will be selected for performances at the 10×10 New Writing Festival to be held in October 2018. The aim of 10×10 is to discover, promote and produce the very best new writing of ten-minute plays. What’s so great about it? If you fancy getting those creative juices flowing and writing a short play on a specific theme, this is a great opportunity to submit to a festival which has a proven track record. Former 10×10 winners have gone on to have their plays produced at the Edinburgh and Brighton Fringe Festivals, the London Fringe and at various other locations across the UK and worldwide – and other past winners have subsequently formed their own theatre companies and been signed by literary agents. So, you want to join the ranks of these success stories and get your work performed at the 10×10 New Writing Festival, submit your short play (along with a synopsis and an application form) by 30 March 2018. “IGNITION” is a new writing night from Into the Fire, which will take place at Theatre N16 on Sunday 22 April 2018. They are looking for 10 – 15 minute scripts with a maximum of 5 actors and minimal set. They welcome submissions from any writer. Please note that this is an unpaid opportunity and writers will be expected to attend on the performance night. They are accepting submissions from all forms and subject of writing but are particularly looking for pieces with elements of Absurdity and Physicality. All plays performed on the night will be seen by an industry panel (panel members to be announced soon) and will receive feedback. How to apply: Email Artistic Directors Calum Robshaw and Naina Kohli at intothefiretheatre@gmail.com, including a short synopsis. Scripts will be read as received. Controlled Chaos Theatre Company is seeking short plays or excerpts from full length plays that writers would like to try out and be brought to life. Following a very successful series of short films shot in 2017 the Royal Birmingham Conservatoire of Actingare once again accepting script submissions for next year’s short films to be shot in Autumn 2018. They are looking for 4 x handed Film scripts, with characters in their late teens to mid 20s, in order to fit the demographic of their 3rd year Actors. It’s very important that the actors should feel they have parity in terms of screen time/lines. The scripts need to be typed up using this template, ideally as a PDF file but if not then in Word. Although creativity should be preserved remember the films are being made on a low budget! Locations have to be doable, writers need to have in mind logistics. (eg Traffic noise and aeroplanes are not good). They are primarily looking for scripts with contemporary settings. Although some period work is possible for example Carriage and Pair and WW1 Tanks are to be avoided! They are mainly looking to shoot interiors. Importantly each script needs to be centric to one location. University Women In the Arts, the one off mentoring scheme to improve the transition for women from studying the arts to working in the arts, has announced its International Women’s Day event for 2018. The event will focus on and respond to the recent discussions on abuse, bullying and harassment in the arts, focusing particularly on female arts students and how universities, the arts industry and students can tackle and help eradicate bullying and harassment in the arts. Taking place at the Royal Court Theatre on March 9th from 3pm, the event will cover what universities can do to help students deal with, tackle and help eradicate bullying and harassment in the arts, what the arts industry can do to help students deal with, tackle and help eradicate this issue, and there will be a session for female arts students, female recent arts graduates and women wanting to work in the arts to share their views and experiences via creating work in response to this subject which will be published. Speakers will include Professor Pamela Burnard, Professor of Arts, Creativities and Education at the University of Cambridge, one of the world’s leading experts on arts and education, and Justine Hardy, daughter of actor Robert Hardy and a leading British journalist, author, psychologist, and conflict trauma therapist. The event will also include a showcase of work created by the fifteen female mentees who have been selected for the private part of the University Women in the Arts mentoring scheme and who were selected from a nationwide search of female arts students at university level. Submissions are open for Gateways from Redgates Theatre in Hackney, East London. Send your submission of a Monologue, Poem, Duologue or Scene, lasting no longer than THREE MINUTES. They are open to all content matter. Please specify if you would like to perform your own piece. They can accommodate for disabled applicants (email andy@redgatestheatre.co.uk for any special requirements). They are looking for committed, enthusiastic and exceptionally talented writers and theatre makers in the early stages of their career. You MUST have a passion for theatre and a strong interest in the wider theatre industry. The Bursary is committed to nurturing and developing the best rural talent, and you may have none of the above experience. People who have genuinely come from a rural background, who do not have the above qualifications or experience, but have an important story to tell can also apply. How to apply: visit the Pentabus Rural Theatre Company website. Shortlisted writers will be informed by the end of April. They will meet with potential candidates in early May with a view to making a decision by 24 May 2018. Deadline: 9 March 2018 at 5pm. Matchstick Theatre are a small independent theatre company, set up in late 2015 and based in South East London. They have produced new plays and adaptations in tunnel arches and festivals around London. They are about to open a new arts and theatre space in Deptford, and are taking submission of all types for new work and collaborators. Mainhouse pieces (Full length) will run for 5-8 shows over two weeks, and will be in full production with an attached Director, Composer and Designer. Development pieces (30 minutes +) will run for 3/4 nights over one week, with a much smaller budget with a focus on developing the writing. A small amount of sound and physical design will be attached. They are looking for only new writing – original stories, or adaptations. They are particularly interested in unusual viewpoints. Accessible stories are important with clear and simple storytelling. Kibo Productions have been offered a three-week slot at the Barons Court Theatre from 16 April-6 May 2018, and they’re keen to use this opportunity to stage a world premiere of a new play. They welcome submissions from playwrights of all ages and backgrounds who have written an original work for the stage. All plays must be received by midnight 3 March and early submission is recommended. They will provide dramaturgical support and feedback on submissions. The selected play will be produced by the company and directed by Sharon Willems. International playwrights are welcome to apply. The script can still be in development but should have a completed first draft. They prefer unproduced texts but will consider plays that have had previous runs elsewhere. Ideally, the action of the play would take place in one or two locations to minimise scene changes. They prefer plays that are socially and politically engaged. They prefer plays with well-developed female characters. The production will operate on a profit-share basis for the cast and creatives. They are working to secure additional funding for the production, and, should we be successful, they will be able to offer an additional stipend for your work.